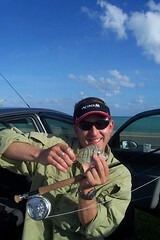 The most consistent flats fishing in the area, involves the 30 minute run towards Flamingo. Try Snake Bight, Garfield Bight and Tin Can channel. Mile Marker 72 or 76 on the Ocean side. There is a marina and a Texaco on the right side of the road for a land mark. Ohio Key(mm39) flat on ocean side, this place has been extremely frustrating for me but I know they are there, once again early or late on incoming tide, watch the flat near the channel as fish will come up onto the flats out of the channels to feed. 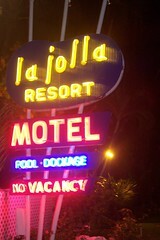 Also, you can just about park in any of the Hotels on the ocean side, grab your rod and access from their beach. 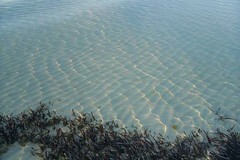 Lots of bones feeding in the early morning before people start waking up and using the hotel beach. At the 7400 block of the Overseas Highway on the ocean side, there is a great flat located across the street from the Rodus Building, 74560 Overseas Highway. Hurricane Georges stripped away what used to be a lovely stretch of sand dunes covered with sea oats bordering this flat. The flat is still fishable, just not as pretty. As you are driving south you will see the remnants of a billboard on your left. This marks the flat. You can park right by the billboard. Across the street you will see the Rodus Building, a square white multi-story building. This flat runs North and south for approximately 1/2 mile, good hard bottom and GREAT bonefishing. Do not park at the North end of the flat as that area is private property and was marked as such the last time I was there. This flat has no rest rooms or any facilities, just very good fishing. Don't pass it up. This is my favorite wadefishing spot of all. A fabulous flat approximately 1/2 mile long with good hard sand bottom. 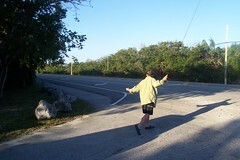 Anne's beach is located just South of the Calusa Marina on the ocean-side. Anne's Beach has two entrances about 1/2 mile apart. There are rest rooms at the North end and hard, marked parking areas at the North and South ends. Each entrance is connected by a great boardwalk, which runs right along the shoreline and has access walks going down to the water interspersed along the boardwalk making access to the flat very easy. There are also covered picnic areas along the boardwalk with tables and benches, just right for lunch. The bonefishing here is very good with an excellent chance of seeing a permit on the South end of the flat where it butts up to a deep-water channel. This is a public park and is very popular with bathers. Avoid the weekends and fish early or late. There is usually plenty of room for fishing particularly in the middle area of the flat. 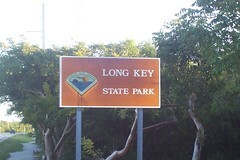 Long Key State Park is located just South of Mile Marker #68 on the ocean-side. This park has an entrance fee of $3.00 per car and is well worth it. The park features camping areas if you are a camper and you can pitch a tent or back your trailer right up to the beach. It also has shower facilities and rest rooms as well as picnic tables. A paved road runs the length of the park and makes access that much easier. I usually turn right after paying my entrance fee and drive about half way down the park to the South and park facing the ocean. A very short walk, 15-20 feet, and you are fishing. On a high tide watch the shoreline, as the bonefish will get right in on the beach and tail. I like to start wading in the middle of the flat and work my way slowly up to the North end in close to the shore line and if the light and the wind are right, move out a little and work back to the South. It just doesn't get any better than this. Excellent facilities and very good fishing. This park is located at Mile Marker #40, right on the South end of the 7-Mile Bridge. Turn left and go down the hill where you will find a good parking area with rest rooms and concrete pavilions which cover picnic tables and benches. A great flat with a nice hard sandy bottom. Excellent bonefishing with a chance of a permit on a high tide. 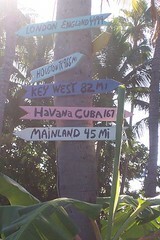 Located on Bahia Honda Key between Mile Markers 36 and 37. 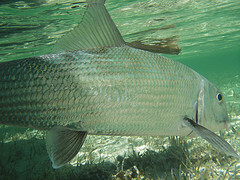 This is very large Park, over 2 miles in length and offers some of the best wade fishing available for bonefish. This flat borders a deep water channel on the North end where there is always the chance of coming upon a permit. It has a good hard bottom and a variety of types of bottom from clean white sand to mottled with some grass. These are five prime locations to get you started. 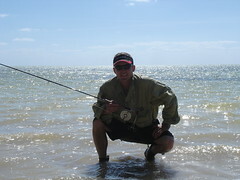 Each location described is public property with easy access and very good fishing at each flat. The State Parks are very popular places, especially during the summer months and should be avoided on the weekends. One note of caution. Always be sure of where you are wading. Do not attempt to cross areas that are green or dark blue in color-these colors indicate deep water. I very seldom wade deeper than my knees. Be aware of what the tide is doing and do not get caught far off the beach with a fast rising tide or you may have to swim part of the way back. This is very difficult with a 9 foot fly rod. Now as for wading the flats, yes, there are lots of spots. water between the old and new Bahia Honda bridges. Bull Shark's up to 250lbs. The Highway Flat a mm 74 on the ocean side. 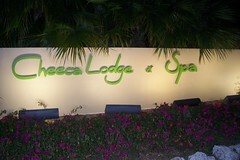 This is a great flat located across the street from the Rodus Building, 74560 Overseas Highway. fishing. Do not park at the East end of the flat as that area is private property and was marked as such the last time I was there. This flat has no rest rooms or any facilities, just very good fishing. Don't pass it up. Anne's Beach is a favorite wade fishing spot. A fabulous flat approximately 1/2 mile long with good hard sand bottom. middle area of the flat. very short walk, 15-20 feet, and you are fishing. On a high tide watch the shoreline, as the bonefish will get right in on the beach and tail. doesn't get any better than this. Excellent facilities and very good fishing. On Vaca Key(downtown Marathon), you might try Sombrero Beach. It is public, has sand, it right next to a realy good cut, might be worth a try in the early am or at dusk. good parking area with rest rooms and concrete pavilions which cover picnic tables and benches. A great flat with a nice hard sandy bottom. but you might find a fish or two..
with shallows on both sides of the street..
property or from the water..
Torch's(little,middle,big, MM 27) and Ram Rod, MM26..
still more spots, going all the way to the beaches of Key West. at the table. The area out behind the ramp may be worth looking at.. "
Flats fishing can be an exciting and rewarding experience for fishermen of all ages, whether just beginning or accomplished angler. Flats are long, level, shallow water areas next to deeper water. They are found in bays estuaries and marshes. They are also found atop reefs and atolls, and along shorelines. The bottom of a flat may be made up of grass, sand, rock, mud, gravel, or a combination of these. Flats with grass or other aquatic vegetation offer cover and food for a variety of fish as well as shrimp and crabs. 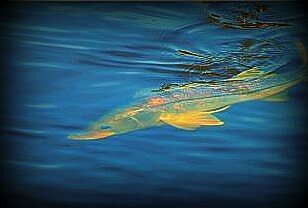 The most sought after fish when flats fishing include redfish, tarpon, seatrout, bonefish, permit and snook. Other popular catches are striped bass, bluefish, barracuda, shark, cobia and mutton snapper. When choosing the best areas for flats fishing, look for flats that are 8 feet deep or less. More productive flats usually contain stumps, brush piles, grass beds or other types of cover. Flats that contain shallow ditches or humps are especially attractive to bass. 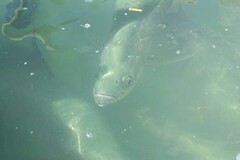 Also look for baitfish, crabs and other fish foods. Observe tides carefully when locating good flats to fish. Some will be totally dry during low tide. As the tide rises, game fish will move in to feed whereas when the tide drops gamefish will wait for crabs and baitfish to flee the flat. 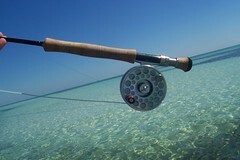 Flats are usually fished with fly gear or light spinning gear. Light tackle is the rule. Fly rods should be 8 or 9 weight. If you are using a spinning outfit, load it with no stronger than 12 pound test. 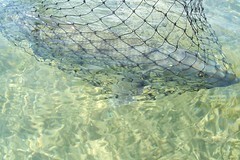 Live bait such as mullet, pigfish, pinfish and shrimp works well. If you are using artificial lures, any size with attractor colors may be used from May through June. If you are flats fishing during July through August, natural colored lures work best. Other equipment to include on your fishing trip is proper footwear, sunscreen, sunglasses, a raincoat and plenty of water to drink. 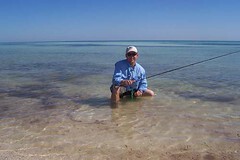 Hydration is important since most flats fishing takes place in sunny climates such as the Florida Keys and the Caribbean, as well as lakes and rivers across the United States and other countries. The most important equipment required is usually a small skiff with no more than two fishermen aboard. This lets the guide pole across shallow waters with ease, to reach the best flats. Also remember to wear light colored clothing to reflect the suns heat, and be less visible to the fish.